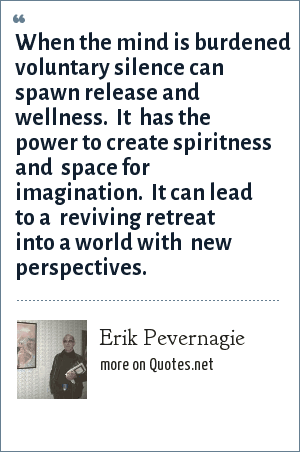 Erik Pevernagie: When the mind is burdened voluntary silence can spawn release and wellness. It has the power to create spiritness and space for imagination. It can lead to a reviving retreat into a world with new perspectives. "Erik Pevernagie Quotes." Quotes.net. STANDS4 LLC, 2019. Web. 18 Apr. 2019. <https://www.quotes.net/quote/63320>.